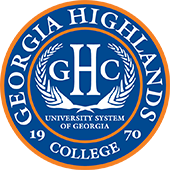 Character – Georgia Highlands College serves as a point of access to higher education in Northwest Georgia. Founded in 1970 as a two-year institution of the University System of Georgia, the college is non-residential and has locations in Rome, Cartersville, Marietta, Dallas and Douglasville. In 2011, the Board of Regents approved a sector change to state college, and GHC began to offer a limited number of baccalaureate degrees. A Bachelor of Science in nursing was identified as the first such degree with a Bachelor of Science degree in dental hygiene which began in the summer of 2015. A Bachelor of Business Administration in Healthcare Management and Logistics and Supply Chain Management began Fall 2017. Other four-year programs that meet the demands of GHC’s service area will be added during the next decade. Locations – To meet the needs of Northwest Georgia’s growing population, the college has expanded from its original, founding Floyd campus location, located 6 miles south of Rome, to five other instructional sites. Health Sciences are housed in a historic building, Heritage Hall, in downtown Rome; the Cartersville site claims the highest enrollment at a site opened in 2005 on Route 20; the Marietta site is hosted on the campus of Kennesaw State University; the Paulding site opened on the town square in the fall of 2009 in the Bagby Building in historic downtown Dallas, donated by Paulding County; and the Douglasville site originally utilized space graciously offered by Chapel Hill High School. A new facility opened fall 2010 in Douglasville on Stewart Parkway. Faculty – GHC has 123 full-time faculty and 162 part-time faculty with a 21:1 student-teacher ratio. Transfer programs – Offered in an Associate of Arts degree with pathways leading to future study in art, criminal justice, English, foreign languages, history, journalism, music, music business, philosophy, political science, psychology, sociology and communications. Offered in an Associate of Science degree with pathways leading to future study in agriculture, associated dental sciences, biology, business administration, chemistry, computer information systems, computer science, general studies, geology, health information management, health professions, mathematics, nursing, physics, engineering, and teacher education. Career programs — The Associate of Science degree is offered in Dental Hygiene, Human Services, and Nursing. Bachelor’s degree programs – GHC offers a fully-online Bachelor of Science degree in Dental Hygiene and in Nursing. Two new Bachelor of Business Administration degrees were added in 2017 in the areas of Healthcare Management and Logistics and Supply Chain Management. Libraries – The Georgia Highlands College libraries provide collections and services at campus locations. The collections contain 80,000 printed books at the Floyd, Cartersville, Paulding, and Douglasville locations, plus provides access to more than 94,000 additional online books and 37,000 more news and journal subscriptions available from any location with Internet access. Other services allow students to request almost any book from other institutions and libraries, particularly those within the University System of Georgia. Athletics – Georgia Highlands College is a Division I member of Region 17 of the National Junior College Athletic Association (NJCAA), and the Georgia Collegiate Athletic Association (GCAA). The athletic program has offerings in men’s and women’s basketball on the Floyd Campus (Rome, GA), and baseball and softball on our Cartersville, GA site. A tradition of success has been established as evidenced by our national rankings, national academic awards, and the teams’ winning records. Student Life – The Office of Student Life seeks to develop the Georgia Highlands College student body through a series of co-curricular activities that promote experiential learning, wellness, an appreciation of the arts, leadership and volunteerism. The OSL encourages and provides student involvement opportunities to complement the academic programs of study and to enhance the overall college experience for all GHC students. All programs, events and functions coordinated by the Office of Student Life at all GHC locations are funded by the student activity fee that all GHC students pay each semester. For this reason, most programs and events available during the course of the semester are FREE for all students to attend and/or participate in. The OSL also coordinates the forming and registration of student organizations by students at all GHC locations and provides resources for those groups as they sponsor a wide variety of programs and events. GHC currently has over 40 active student organizations.